OK -- we're WAY overdue for a Forty Niners blog post. Two reasons though: one, I've been so preoccupied/obsessed over the San Francisco Giants' streaky performance as of late in their quest to make the playoffs for the first time in six years, adding football to that stress fest would basically write Michael Crabtree on draft day...you know, back when Niners fans still liked him.my ticket to the nut house. And two, I've needed this long to calm down about a certain unsigned rookie's actions to be capable of writing a G-rated post. 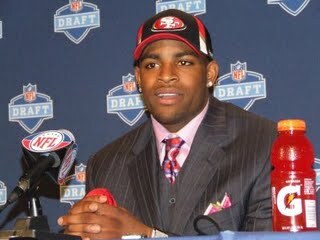 And so here we go with -- you guessed it -- Michael-bleepin-Crabtree, as he's become known amongst Niners fans. The Texas Tech wide receiver's mind-numbingly long hold out on his team is no longer about the money. He'll sign a worthy contract and his agent, Eugene Parker, will see to it. It's Crabtree's ego that's causing the delay and while it may not cost him very much money now, he could very likely be devaluing himself in the long run. Check out San Jose Merc columnist Mark Purdy's great breakdown on why this mess is so completely unnecessary -- Crabtree should be paid according to what he was drafted at, not paid according to how he wishes he was drafted. Instead, the 21-year-old (how many of those do you know make great financial decisions, by the way?) has missed training camp, has missed out on building a rapport with his team and especially his quarterback Shaun Hill, and is most definitely ruffling some major feathers with veterans who would like to move past the drama and put together this football team already. And let's not forget the fans who were ecstatic on draft day to have a such a potentially explosive addition to the offense who could finally take some of the opposing defense's heat off RB Frank Gore. Now it looks like we may have another Terrell Owens drama queen on our hands and the guy hasn't even signed on the dotted line yet. The longer Crabtree holds out, the less love there will be from the fans come game day. And the longer he demands to be paid money for something he has not yet accomplished, the less patience the front office will have with him. Players who act up get traded. Just ask Jay Cutler and Jeremy Shockey. Players who are allowed time with a team and an offense to grow and really hone their talent make themselves a product desired by any team -- not just the one with a hard nosed coach willing to take the risk -- and worth the big bucks a long-term contract promises. Just ask T. J. Houshmandzadeh (eight seasons with Cincinnati and now a $40 million contract with Seattle) or Dallas Clark (drafted by Indianapolis in 2003 and signed a $41 million extension in 2008). Unless of course Crabtree's goal is to be a journeyman football player, never signing a contract longer than two years and always being known as "that guy who used to play for...."
Then by all means, Michael, keep it up.